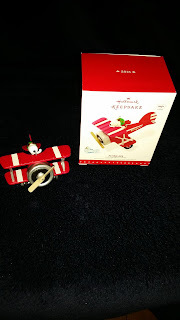 Minta's Creations: Peanuts® Flying Ace Snoopy's Red Plane Ornament Review and Giveaway! Peanuts® Flying Ace Snoopy's Red Plane Ornament Review and Giveaway! I received this Snoopy ornament to facilitate an honest review but my opinions are 100% my own! I remember when I was a kid that I absolutely loved Charlie Brown and the gang but Snoopy was absolutely awesome! I love keepsake ornaments and who does it better than Hallmark? Snoopy is no exception - the detail on this ornament is really amazing! Plus it comes with batteries so when you push the button you can hear the Flying Ace sound off!! Also: Hallmark and the Peanuts Movie are hosting a sweepstakes giving away a Private Movie Premiere in the winner’s hometown. For more information and to enter, please visit https://snoopysweeps.com/hallmark/. Also: I get to give one of these beautiful Snoopy ornaments to one of my Minta's Creations readers! US only! Hallmark will send you your own personal Peanuts Flying Ace Snoop's Red Plane Ornament that any Snoopy fan would love! I love all of the Peanuts characters! I would have to say that Woodstock and Snoopy are two of my favorites. I've always loved Snoopy most of all. He cracked me up! Loved his voice. Snoopy of course:) also Woodstock can't leave him out!!! I've alwas been a Chuck Brown kind of girl. He's my favorite. Love bald head guys with chevron on their shirts that are the under dog. Oh Snoopy is our favorite! He always makes us laugh! Charles Schultz went to JHS! We love Snoopy of course. My kids do too. Lynus was a fave but I do love Snoopy too! My favorite is Schroeder because he is a musician like me! Pigpen has always been one of my favorite peanuts character. I have been known to be a little messy myself.